With our Eclipse range, you’ll get the most from your residential interiors budget with a stylish, yet very cost-effective furniture solution. Even when working to a strict budget, Eclipse ensures you get the best in furniture design and construction. Whether you are furnishing a completely new project or refreshing an existing building, Eclipse is the most competitive option available. It comes in five laminated finishes, Aragon Oak, Romana Cherry, Tobacco Walnut, Maple and White. The Eclipse Maple finish is ideal for any single-living accommodation project. As a light-coloured timber, it offers excellent reflective qualities, making it perfect in small confined rooms. 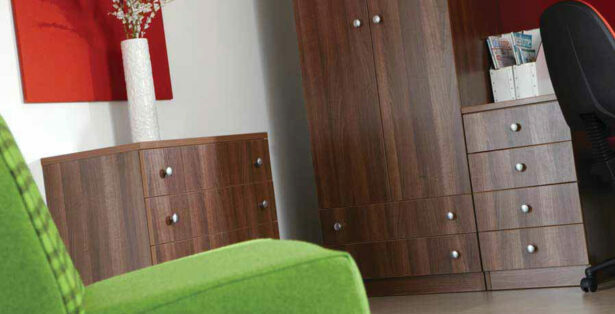 From care homes to hotel suites, this range has the storage capacity and the flexibility to furnish single-living units of all types with style and practicality. Crisp and minimalist finishes including Aragon Oak and Eclipse White are ideal for student living quarters. Aragon Oak lends itself particularly well to occasional furniture pieces like coffee and dining tables, dressers, and cupboards, and free standing bookcases and open fronted TV units. 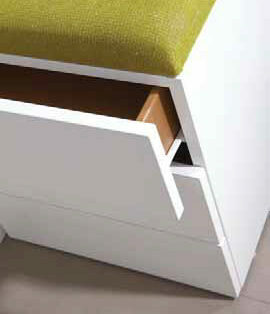 Outstanding storage capability makes Eclipse an excellent option for student accommodation. Eclipse has always been a popular choice of the armed defence and civil forces. With its ability to withstand high levels of wear and tear while retaining its pre-designed aesthetics, it has everything this sector needs. While all finishes are popular, we feel the Tobacco Walnut and Romana Cherry have the potential to offer this robust range an extra level of style.